In early July 1911, Picasso left Paris for Céret, a small town in southwestern France, near the Spanish border. Braque joined him there in August and the two painted their ultimate “Analytical Cubist” works in intense dialogue. 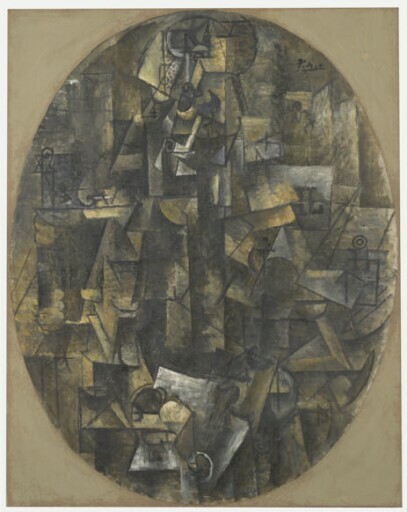 Analytical Cubist painting is characterized by complex linear scaffolds—in this case long vertical lines at roughly equal intervals and sets of isosceles triangles—and by scores of small brush marks, interlocking and overlapping like pieces of a jigsaw puzzle in progress. While most of the marks in Man with a Pipe are baffling in terms of representation and serve primarily to establish visual rhythms, a few fragments of graphic information are legible. Easily spotted just above the middle of the painting, the white clay pipe helps locate the man’s head, with its half-lightened, half-darkened mustache, suggesting how one side of his face is turned toward some source of light. The eye and nose can be discerned by extrapolating from the placement of the mustache. A white rectangular shape at the bottom, a piece of paper, indicates where to look for the man’s hands. Man with a Pipe presumably represents the interior of a dimly lit, smoke-filled café—hence the letters est detached from the word Restaurant and the letters AL to suggest JOURNAL (“newspaper” in French).